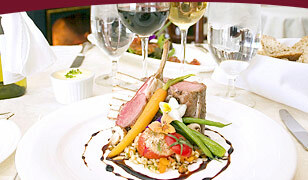 Click here to view more recipes from the DesBarres Manor culinary team. In a large stock pot, sauté chopped garlic, celery and onion in olive oil over medium heat for about two minutes. Add the stock and diced sweet potatoes and bring to a boil. Reduce heat and simmer until potatoes are soft, about 1 hour. Using a hand blender or food processor, puree the soup until it is smooth. Add the maple syrup, nutmeg, whipping cream and brandy and continue to simmer for another 15 minutes. To serve, place one cup in a heated bowl and garnish with chopped garlic chives and sour cream. We recommend the Goundrey Offspring Chardonnay from Western Australia as it is well-balanced with just the right amount of oak and fruit. The oak gives the wine just the right amount of softness to work with the root vegetable and the fruit does not compete the sweetness of the maple. A red pairing would be the Avon Rouge which is a blended wine with Marechal Foch grapes from the Sainte-Famille Winery in Nova Scotia’s Annapolis Valley. The soft tannins of this wine would make it very enjoyable with the soup.